In the winter time, many locals come out of the woodwork, put on their snowshoes, etc., and enjoy winter sports, like ice fishing. 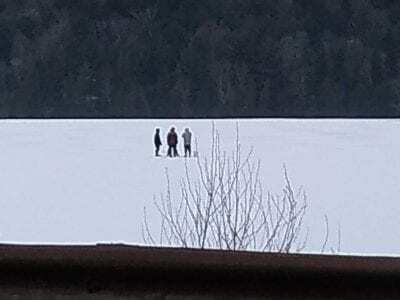 For most of the country, January 1st is the time to start New Year’s Resolutions, but for many on MDI, it marks the start of ice fishing season, which typically concludes towards the end of March. Consider this blog post your complete guide to ice fishing on MDI… and if you know something we don’t, comment below and we can add it to the post (and credit your genius of course). The first matter of importance when discussing ice fishing is safety. As with any outdoor activity in the winter, it is important to dress warm enough to prevent cold-related conditions like hypothermia or frostbite. Here is a helpful guide for dressing appropriately for ice fishing. The mantra that we lose most of our body heat from our head is no longer viewed as true by the scientific community, it is important to cover all body parts because having any exposed skin or body parts results in heat loss from radiation. Also don’t drink alcohol or if you do, moderation is key. It can it lead to unsafe decisions, and your body (while it may feel warmer) actually loses heat faster when alcohol is consumed . 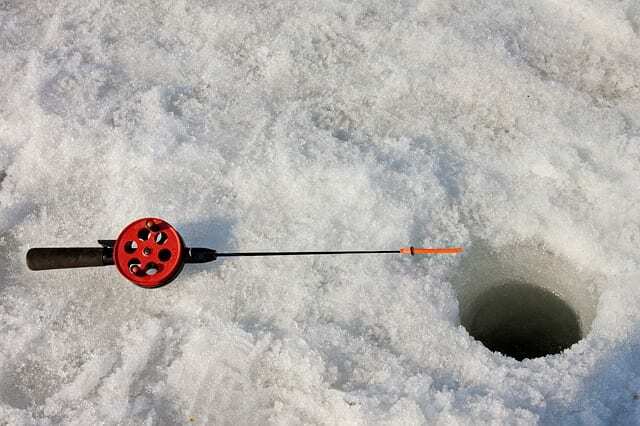 One of the biggest questions people have regarding ice fishing is, “How thick should the ice be?” The American Pulpwood Association has developed a table for judging the relative safety of ice on lakes and streams. This is just a guide; use your own good judgment before going out on any ice. Avoid areas of moving water, including where streams enter the lake, and around spillways and dams. Note: This guide is based on clear, blue, hard ice on non-running waters. Slush ice is about 50 percent weaker. Clear, blue ice over running water is about 20 percent weaker. Many ice anglers do not like to fish on less than five inches of ice, and do not like to drive a pick-up truck on less than 15 inches of ice. Use common sense! So it is important to recognize that places like Jordan Pond, where there is moving water and spring feed, the ice can move from thick to thin rather quickly. So be vigilant. Now that we have had the necessary discussion of safety, we can move on to the fun stuff, like where to fish and where to get your gear. For appropriate clothes to keep warm, you can go to Cadillac Mountain Sports in Bar Harbor or Ellsworth. But they won’t have the actual ice fishing accessories you need out on the lakes or ponds. For some of those items, you can stay on-island and go to McEachern & Hutchins in Southwest Harbor, Paradis True Value Hardware in Bar Harbor, or F T Brown Ace Hardware in Northeast Harbor. These places may be helpful if you simply have a few missing items you need to fill in. But if you want to make sure to get all the items you need in one stop, your best bet is going off-island to Ellsworth where Willey’s Sport Center in The Mill Mall will have all the equipment you need. Except bait. There are grocery stores, gas stations, and various other places that sell bait on MDI and the Ellsworth area. But at times it can be a struggle to get the exact bait that you want. To avoid a thousand phone calls and driving around on a wild goose chase, try Burns Live Bait Shop in Bangor. It is a family business with the current owner being there for 60 years. They are open from 6am to 9pm, 7 days a week,365 days a year. They will have all the bait, and advice, you need. So, we got our gear, our bait, and our safety knowledge, but where do we fish? Brook Trout: Upper Hadlock Pond, Lower Hadlock Pond, Round Pond, Echo Lake, Eagle Lake, and Lakewood Pond. Salmon: Echo Lake, Long Pond, Eagle Lake, and Jordan Pond. Smallmouth Bass: Seal Cove and Hodgdon Ponds. Pickerel: Somes Pond, Long Pond, and Seal Cove Pond. What bait is most effective? It depends what you are fishing for. Salmon: Smelts or common shiners. Brook Trout: Powerbait or shiners. Smallmouth Bass or Pickerel: Worms. Some people chum the hole with dog food to attract fish but this is illegal so don’t do it! You can also jig with a tiny rod and lure. Friendly competition is part of ice fishing. Often it takes place with informal games between friends. 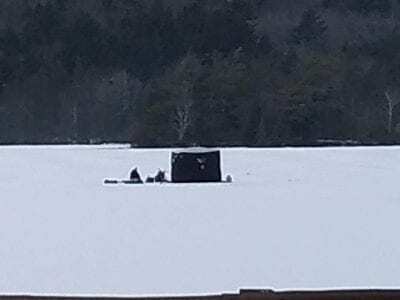 But MDI also has a more formal, organized type of friendly ice fishing competition every winter in Tremont. The Tremont Consolidated School Annual Ice Fishing Derby is the real deal. There is a raffle that costs five dollars to enter and has some serious prizes. Raffle prizes from past years included a lifetime fishing license and a side-by-side vehicle worth almost $10,000. Hot food is served at the school in the afternoon. The weigh-in is done by an experienced biologist and prizes for top catches are awarded. And all of the money goes to good causes: the eighth-grade class trip and Parent Teacher Organization. We would be remiss if we didn’t remind you to follow the rules. There are game wardens across the state enforcing the rules–not just on the ground, but also from above performing aerial surveillance. It is in the best interest of everyone to comply. And to fish, of course, you need a fishing license! A Fishing License is required for Maine residents 16 or older and non-residents 12 or older. Here are some local places you can purchase fishing licenses. We hope this post has given you some ice fishing inspiration! Stay warm and have fun! 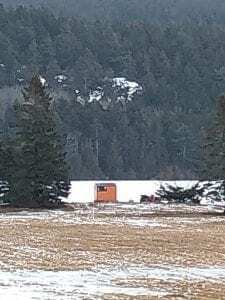 Photos in this post are courtesy of Jane Holland of ice fishing adventures from Seal Cove & Echo Lake. You really should take this part off the website. Chumming in Maine is illegal and I’d to see someone get in trouble if they read this. Hope this helps. Thanks Mike, appreciate your help and we’ll change that right now!